As a part of its attack on the Bharatiya Janata Party-led government over the Rafale deal, the Congress party today tried to gherao the residence of Prime Minister Narendra Modi. This came after Union Finance minister Arun Jaitley posted a detailed response over the allegations about the deal in a Facebook post, after which he and Rahul Gandhi traded accusations on Twitter. 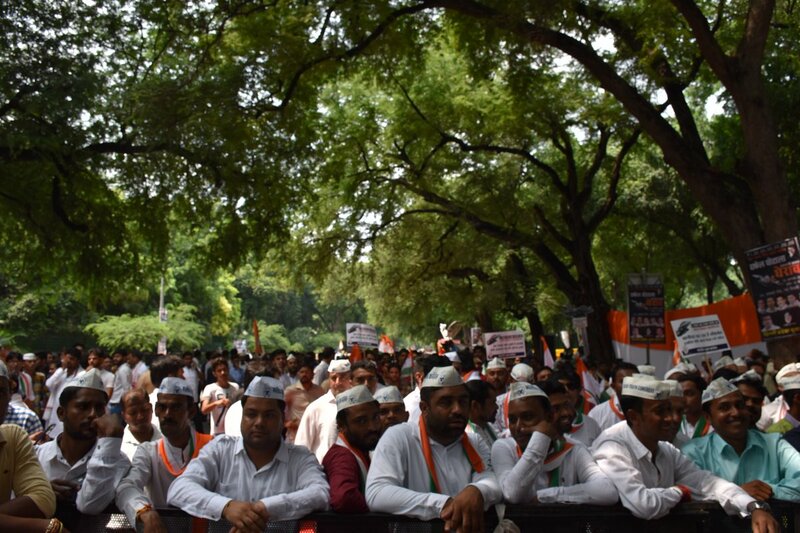 On Thursday, hundreds of Congress party workers came onto the streets in New Delhi and tried to gherao the PM residence, but they were stopped by security forces. After that, they staged a protest. Senior Congress leader Hanumantha Rao said the prime minister has not answered “properly” on the Rafale deal. “People who have no experience in defence manufacturing have been awarded contracts under this deal. We want to know how much money is being wasted in this,” he said. Congress is trying to intensify its offensive Modi and BJP in the run-up to the General Elections next year, and this seems to part of that strategy. It is, however, interesting to note that Congress chose to gherao PM’s residence on a day when PM is not even in the country. On Thursday morning PM Modi arrived in Kathmandu to attend the BIMSTEC Summit 2018 which is being held in the Nepalese capital. BIMSTEC (Bay of Bengal Initiative for Multi-Sectoral Technical and Economic Cooperation) is a regional organisation of seven nations of South East Asia, comprising Bangladesh, India, Myanmar, Sri Lanka, Thailand, Bhutan, and Nepal. With SAARC virtually rendered ineffective as a regional organisation, largely due to non-cooperation of Pakistan on various issues, India has been giving more importance to BIMSTEC in recent times. It also fits nicely with India’s effort to increase cooperation with South East Asian nations, though its Look East policy, which will also help in the development of North Eastern states of the country. The point of a ‘gherao’ is generally to disallow a person from leaving the premises so they are eventually forced to respond or negotiate the protesting party’s demand. One wonders how the Congress plans to ‘stop the PM from leaving his residence’ by a ‘gherao’ protest when the prime minister is not even in the country, let alone his residence.